Dr. Cooper was incredibly sweet and thorough with me! I’ve been on and off sick for several weeks since I movedto Houston, so she patiently listened while I walked her through all of my symptoms. At this point, I was starting to panic that it could be something severe, but she calmly addressed my concerns. When she suggested a quick nose probe (HAAA! I am NOT someone who handles the idea of a wiry, snake-like probe making its way into my throat from my **nose**) she laughed with me and helped me get through the less-than-30-seconds of discomfort seamlessly so we could put to rest a couple of bigger problems I was worried about & talk about a game plan going forward. Easily one of the nicest, easiest, most informational experiences I’ve had with a doctor and I’ll definitely be going back to her with any future ENT issues. Dr. Cooper was incredibly sweet and thorough with me! I’ve been on and off sick for several weeks since I moved to Houston, so she patiently listened while I walked herthrough all of my symptoms. At this point, I was starting to panic that it could be something severe, but she calmly addressed my concerns. When she suggested a quick nose probe (HAAA! I am NOT someone who handles the idea of a wiry, snake-like probe making its way into my throat from my **nose**) she laughed with me and helped me get through the less-than-30-seconds of discomfort seamlessly so we could put to rest a couple of bigger problems I was worried about & talk about a game plan going forward. Easily one of the nicest, easiest, most informational experiences I’ve had with a doctor and I’ll definitely be going back to her with any future ENT issues. ONCE YOUR APPOINTMENT HAS BEEN SCHEDULED YOU WILL RECEIVE AN EMAIL FROM OUR OFFICE TO COMPLETE YOU PATIENT FORMS; UNFORTUNATELY THE FORMS ON ZOCDOC DO NOT COVER WHAT WE NEED AT CHECK IN! Dr. Cooper was born in Western Springs, Illinois and attended college at the University of Notre Dame in South Bend, IN. She completed her medical school training at Texas Tech University in Lubbock, TX and was a member of the Alpha Omega Alpha honor society. 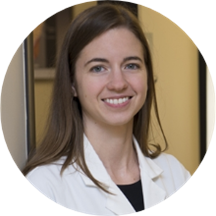 Dr. Cooper completed her internship at the University of California - San Francisco and her residency at the University of Colorado in Denver, CO. She is interested in treating patients of all ages. Please DO NOT complete the ZocDoc patient forms online. Our practice uses an Electronic Medical Record (EMR) and you will receive an e-mail inviting you to the Patient Portal once you are registered as a patient. You will also receive an e-mail reminder prior to every appointment which will allow you to complete/update the information you would have entered in ZocDoc. You will be able to complete this information in the privacy of your own home or on your phone. No more filling out 10 pages of paperwork with your address 5 different times! We value your time and do not want you to waste your time completing the ZocDoc online forms. Been here twice and Dr. Cooper does a great job each time. Would highly recommend! Sarah was very personable and easy to talk to. I waited about 10 minutes in the waiting room, and then close to 30 minutes in the exam room. Dr Cooper acknowledged the time and apologized for the wait. I will keep her as my ENT going forward. This was my second visit to Dr. Cooper. The first time she warned me of the dangers of sleep apnea and highly recommended I get a sleep study. I did and found out I have a pretty severe case of sleepapnea which is not only a drag on one's overall health, it can be fatal. Without her strong encouragement to get this checked out, I probably wouldn't have. The second time she gave a valued second opinion on the sinus surgery I was considering elsewhere. She patiently and professionally thinks through medical issues and does a good job explaining all options. Highly recommend! She was SO friendly and compassionate! Wonderful with kids!! Was great with my 9 year old daughter and quickly assessed and diagnosed our problem. I highly recommend her. Love Dr.Cooper! She is so good with my 3 year old son, who is the patient. We’ve been seeing her for about 2 years! She is far from our house, and we have option to see any ENT that is closerwith our insurance but we will continue to see her for his needs! She was very professional and listened to all of my concerns and addressed them. Her and her staff are very knowledgeable and I learned a lot and felt extremely comfortable. I have mild anxiety about going to the doctor usually and felt heard and helped here. I didn't appreciate her pushing the idea of the sinus balloon surgery because I'm not interested. She acted as though she's tired of seeing me only to give me antibiotics for sinus infections. Her nonverbal body language and attitude expressedthat she was disgruntled I refused the procedure. I'll never go to her again. I'm glad that I was able to find a doctor that focus on sinus issue. She is awesome. Great bedside manner, very professional and quick! Friendly, but quite a long wait. Hopefully treatment is correct! My first time visiting an ENT doctor but she was so patient and thorough, making sure I understand and know exactly what's going on, I would definitely recommend her to everyone. Awesome! Patient and thorough answers. Really liked this dr. She made me feel very comfortable, diagnosed my problem and got me out quickly . Will definitely go to her again . Great! Diagnosed my issue right away and prescribed the proper medication which cleared up the problem quickly. Will continue using this doctor for any future ENT needs. Dr. Cooper and her staff was amazing! They took care of us, and once we were in a room, the process went very quickly and smoothly. Definitely will recommend her to see my family. Great experience. Great staff. Dr. Cooper is very professional and explains all with very simple language, yet she is sharp and cures me all the time! Sarah took one look at my throat and deemed I likely had tonsil stones because of small white patches on my tonsils. It was negative on the strep test I already had done. I had to ask her if it couldpossibly be viral but she said she didn't think so although she said it could be possible. She was patient and willing to answer any questions, but it was quite confusing because the day prior, I saw a physician assistant who said it was likely viral, and said it definitely did not look like tonsil stones (I also communicated this to her). I even asked repeatedly if she was sure, if there was anyway she could check further--she didn't even look twice. She just shrugged and said that if I go home and poke around at the patches to figure it out--that they might be stubborn to come out but that they're probably tonsil stones. I ended up poking at my tonsils uncomfortably for two hours, nothing came out. A day later, the white patches were nearly gone, my tonsils were no longer swollen, and was most likely viral as the physician assistant suggested. I'm disappointed that an ENT doctor would not take a little bit more time to help me rule out what I didn't have and instead, gave me the wrong impression going home. I saw an allergist who was surprised that she didn't at least poke around to help me figure out it was most definitely not tonsil stones. Wish I didn't waste my money on this appointment. Sarah and her team were simply GREAT! General impression from her was good. She seems very nice, easy to talk to. I had been to a previous ENT a month ago and didn't get the right diagnosis on the first try(I guess that happens), so i'm glad shewas able to point out the problem from the first visit. Went in for a minor sinus infection. Felt the staff and Dr. Cooper were professional and personable. The staff had to handle a difficult customer while I was there and although not perfect, they did a good job and did notescalate the situation. Dr. Cooper diagnosed my issue and didn't over prescribe. She was very thorough and asked great questions to find out my issues. Tech-friendly office shortened my wait time. Thank you. DR COOPER WAS VERY GOOD & I WOULD HIGHLY RECOMMEND HER. Dr. Cooper was wonderful - I have to see her again in a few days for a follow-up, so hopefully my sore throat is gone by then! Dr. Cooper was very thorough in her examination and explaining the treatment plan for my 4 year old son She is truly a GREAT doctor! It went very well. She was very knowledgeable and sweet! Best doctor's office experience I've ever had. Everyone is super friendly and helpful. Dr. Cooper is very knowledgeable and took the time to clearly explain my diagnosis and answer all my questions. They wait was short and most all of thepaperwork, payment and prescription were handled with technology. Great experience, would highly recommend this clinic and Dr. Cooper. Super great! Got my ear clean very quickly, verbally walked me through everything she was doing as she was doing it. Didn't experience any discomfort as she pulled all that wax out of my ear. Now I can hear out of my left ear again! So great! I was very impressed with her knowledge and in the manner I was treated. She is very nice and professional! Dr. Cooper was very helpful and informative and took the time needed to address all of my concerns..highly recommend her.